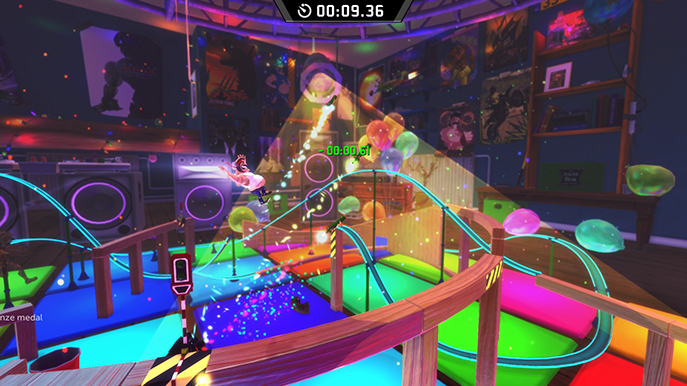 I found myself struggling to enjoy Action Henk when I began to play through it. I wasn't fussed about what my time in a level was, as long as it was quick enough to get at least a bronze. The whole thing felt kind of standard. Then, without noticing, I was starting to restart levels after making the slightest mistake, activating the gold medal ghost and looking for the most efficient route through a level. It had got its hooks into me. Despite my initial concerns, Action Henk is a good time. 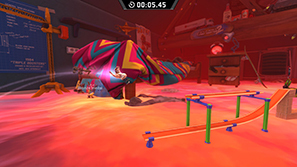 Action Henk is a 2D running game set in 3D environments. The majority of the time you'll be racing against the clock; though there are boss levels where you race against other characters. There is a focus on momentum, Henk (or any of the other playable characters) can slide down slopes to build up speed. The tracks resemble those orange Hot Wheels pieces and are accompanied with other small household items. Each level is around thirty seconds long and you'll find yourself progressing pretty quickly. In the first two worlds each level remains somewhat simplistic. A few shortcuts or techniques for faster movement may be hidden away but it's straight forward. It's not until you get about halfway in that the levels become clever, difficult and engrossing. Turning on the Gold Medal ghost proved to be a great motivational device; something I'd suggest you do from the start. It displays the needed pace and gives you something to race against. The levels get more and more complex and interesting in their design. Some levels include a grapple hook. These levels are an enjoyable change of pace though it's not as precise as I'd like. Swinging from below, round and to the top of platforms can be somewhat hit and miss and will result in having to restart the level numerous times. Luckily, by pressing B, you can instantly restart the level. A lot of the game takes place in a child's bedroom, though with a couple variations: disco and halloween. I was pleasantly surprised to find a change of background location from the fifth set of levels onwards. 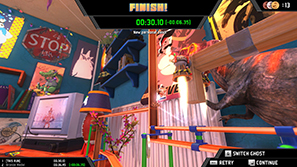 The visuals are detailed and colourful with lots of amusing popular culture references in the background of levels; posters depicting Sonic and Jaws but with the protagonist replaced by Henk for example. The game runs smoothly apart from when you hit the finish line in each level, where it pauses for a moment. The difficulty is lacking consistency throughout. The first few sets of levels offer no challenge, then the next are just right; requiring practice to get the gold medal while being fun and inventive. Then, there is an enormous difficulty spike in the final set of levels. There are techniques needed to traverse these levels that aren't included in any part of the game leading up to it. Even examining the gold ghost's methods didn't clue me into how to do it, even when imitating everything it did. Ultimately, I did get through these levels, but purely through a frustrating amount of trial and error. Beating the final boss will unlock a final secret world. I've not been able to complete any of the levels in it, despite many attempts. 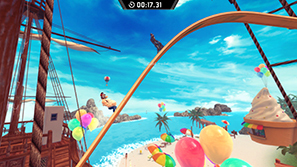 Elsewhere, there is an online mode which you race against other players vying for the best time on a level. 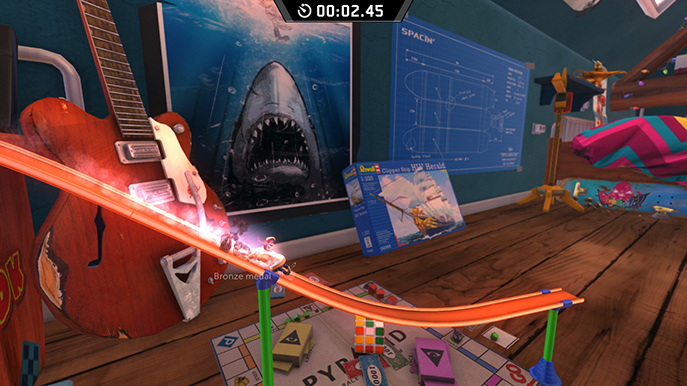 In the time limit you'll be able to race three to four times. 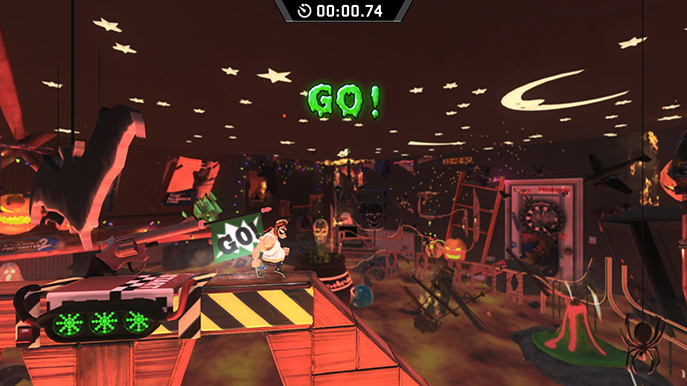 Other players appear as ghosts. This would be a great way to play Action Henk and I didn't run into any hitches online. The problem is, the servers are empty. It's difficult to find human opposition. A level editor is included as well as workshop support. This gives the game a good amount of longevity; pretty much as long as you're still interested in it. You can use any of the locations and items from the game's main mode. Action Henk looks great and plays well for the most part. I finished the main mode's levels in about three hours with mostly gold and silver awards. With exception to the first couple sets and the final (before the hidden world), I found it to be entertaining and engrossing. Engrossing to the point where I'd instantly restart a level if I made a single slip up. The short length of each stage means you don't waste too much time when attempting to get the gold. There are a fair amount of unlockables too; different characters and skins, as well as a secret level in each area.